Dave Zatz: To this point, we haven’t really seen any easy or economical methods for getting Hulu content (back) onto the television. 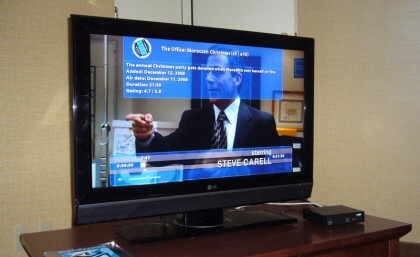 Most solutions require a PC in the mix – either relaying the video (ZvBox, SlingCatcher, PlayOn software) or as a PC-at-the-TV (Neuros LINK, Boxee on AppleTV). So, it was quite refreshing to swing by SageTV’s suite earlier this evening for a pre-release demo of Hulu playback direct from the compact SageTV HD Theater. Dave Zatz: Over these last few years we’ve innovative new methods to remotely control our television (devices) have started to crop up. Both the hardware and 10′ interface. With the driving force being the exponential increase in the number of channels and types of content we receive. Dave Zatz: Internet radio service Slacker has made good on their promise to deliver a Blackberry client. Unlike Pandora on the iPhone, which only streams music, Slacker has the ability to both stream or download tracks. Meaning, it’s possible to load up the Blackberry microSD card with your favorite “stations” before commuting via plane or subway. Dave Zatz: The early SlingCatcher reviews were decidedly mixed. But, after speaking with project manager Matthew Feinstein last night, I’ve got decent news for owners and potential customers. Dave Zatz: I spent some quality time catching up with the Hava team yesterday. They make a line of placehifting products that compete with the Slingbox. And like the Sling of old, Hava’s not afraid of taking on big media. Mari Silbey: I stopped by the Kodak booth to check out their Wi-Fi photo frames but spent most of my time playing with the Kodak Theatre HD Player. It’s basically just another media extender – YouTube, Internet radio stations, etc. – except since it’s Kodak the company highlights the photo sharing capabilities. Dave Zatz: I’ve been disappointed in Microsoft’s apparent inability to deliver an IPTV solution onto the Xbox 360 platform… As announced during Bill Gates’ 2007 CES keynote. We’ve heard relatively little regarding the fate of Xbox IPTV since then, and I imagine the lack of deployment is related to both technological challenges and carrier deals. So I cornered a Mediaroom rep today on the show floor. Mari Silbey: Over at the Qualcomm booth today was a strange little application called Mikz from a company called Conveneer. Just launched on select Qualcomm phones, Mikz gives your cell phone a URL so that other people can browse the media on your handset.